Cypress Security relies on the highest technology available in the marketplace for its video surveillance service. Digital IP camera technology with high definition imagery, streaming, software applications and interface capabilities is an effective tool available to our customers. We monitor your property via live video feed 24 hours a day, 7 days a week, and 365 days a year. If our monitoring specialist observes and suspicious activity, they will sound an alarm and strobe lights while dispatch our mobile patrol unit to the site. Local police will be alerted when there is a concern that burglary or invasion is in progress. Our Live monitoring does not only prevent crime but also provide vital evidence in case of crime. Cypress Security has been serving the Lower Mainland and Calgary for over a decade with professional property protection. Cypress Security prides itself in providing fully licensed, bonded and insured security guards for Vancouver-area facilities. When you require uniformed security personnel for your business, event, or building, we will offer your site a professional presence. We give our guards industry-leading training and utilize GPS guard tracking technology to ensure your site is free of theft, vandalism, break-ins, or any other criminal activity. Cypress Security specializes in mobile patrol. We’ve worked with a range of businesses and our patrol team can easily monitor your facility using our marked security vehicles. This is particularly useful for businesses that are located in areas with high crime rates. Our bike patrol services are a great option for events where guards need to cover a large amount of ground in areas away from roads (like festival fields and marketplaces). We’ll tailor our services to your requirements and we’re available on short notice when we’re needed. All of Cypress Security guards are licensed, trained and insured. All security guards go through extensive training to ensure our clients receive exceptional performance and offer the upmost respect and professionalism towards your staff, clients, each-other and anyone else involved within your business. 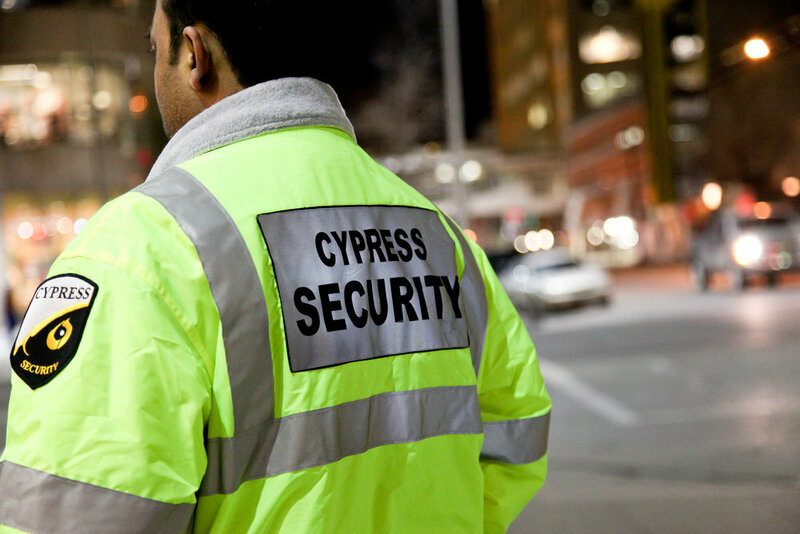 Our security guards are cleanly uniformed with the Cypress Security logo in order to enhance your professional business appearance with employees and clients.